More Thoughts about Writing. | Wendy J. Dunn, Award-Winning Author. Better late than never, as the old saying goes. Over the years, I had heard great things from other writers about Stephen King’s On Writing. I am now ashamed to admit I avoided the work because a “horror writer” wrote it. As my family and friends (especially John, my long time, suffering dentist) know, I am Wendy the Wimp. Well, not all the time. A woman who has given birth four times cannot be a complete wimp. But, I confess, watching Carrie as a young thing gave me nightmares. I have never forgotten Carrie’s hand coming out of her grave in the dream sequence ending the movie. After Carrie, I stopped going to horror flicks. Then I read The Shining. No more horror novels. Tell you the truth, I get enough nightmares from reading newspapers and my non-fiction research books when my eyes are opened, once again, to the evil humans do to one another. But I am so glad I decided to read On Writing this week. 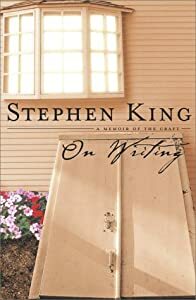 Stephen King’s musings about writing are so aligned to my own beliefs I came away from the work inspired and affirmed. And wanting to brave reading King’s works again. Really, I am brave; I am a writer. “Everything is a text; this is a text,” [Derrida] said, waving his arm at the diners around him in the bland suburban-like restaurant, blithely picking at their lunches, completely unaware that they were being “deconstructed” (Derrida 2013). Yes – a writer deconstructs their world for the purposes of writing. Like Stephen King, I am the first reader of what I write. I write firstly for myself, and that is the reader I must satisfy before giving my writing to other readers. My first forays to explore new writing territories are for my eyes only. Knowing that frees me to write – frees me to write whatever bubbles up from that writing well of mine. At that stage of the writing journey, I indulge myself with permission to just to write. I give myself permission to write rubbish because there is nothing more satisfying to me as a writer than to discover what I am really trying to say and turn this rubbish into real writing, and “find the truth inside the story’s web of lies” (King 2010, p. 159). When I write I always discover unpolished gems worthy of polishing, or a vein of glimmering gold that, by digging, may open up to reveal its true promise. By allowing myself the freedom of uncensored writing I open the door to possibilities and potential – the chance my writing will take me somewhere unexpected, if I allow myself complete submission to my art. By writing I deconstruct and then construct how I see my world – for “human beings require the mediation of consciousness, or the mirror of language, in order to know themselves and the world” (Lechte 2007, p. 131). I believe writing is an Art form. Like all Art, writing builds bridges of understanding, of reverberation, of revelation, of connection. All writers bring to this Art something different that belongs just to themselves, and their experience of living. I agree with King that this is the true beating heart of “Write what you know“, and what it really means in writing. If we write what we know about life, then the force is with us when we write, and in our writing. That’s when we build that bridge of communication to readers. I see the first stage of writing as the time I dig out the clay of my life experience, locating the story waiting to be written. Stephen King says in his book, “stories are found things, like fossils in the ground” (King 2010, p. 163). I suspect what he labels as fossils and what I think of clay are one and the same. Interestingly, King and I also do not plot our work, rather we prefer to throw our characters into situations that result in cause and effect, and move our stories forward. Through writing, we find these stories, the stories waiting to be told. They are within us all. Once I have my clay of my story, I sculpture it until I construct the first draft, the time for me to look at it with harder eyes (sigh – something that never becomes easier) and make it ready for my Ideal Reader. King speaks very lovingly of his wife as his Ideal Reader. My Ideal Reader is not one person, but many – those readers who loved my first novel, Dear Heart, How Like You This? I yearn to write for them a novel that will also touch their hearts. I am very conscious of my Ideal Reader, as I sculpture my writing into its finished form. I also become more aware of the fluidness of writing – that “everyday language is not neutral; it bears within it the presuppositions and cultural assumptions of a whole tradition” (Lechte 2007, p. 109). That helps explain, with our different life experiences, why our readers perceive text differently to the way we expect of them as writers of this text. A reader’s reaction to the text opens that door of deeper understanding for the writer, too, showing the organic nature of writing and reading. And the true power of writing and reading. Like King, I know the reality of magic because I read and write. Presidential Lectures: Jacques Derrida: Introduction . [ONLINE] Available at: http://prelectur.stanford.edu/lecturers/derrida/. [Accessed 06 March 2013]. John Lechte, 2007. Fifty Key Contemporary Thinkers: From Structuralism to Post-Humanism (Routledge Key Guides). 2 Edition. Routledge. Stephen King, 2010. On Writing: 10th Anniversary Edition: A Memoir of the Craft. 10 Anv Edition. Scribner.